The anticipation is over and Team USA has not disappointed as they have won several gold medals early at the 2016 Rio Olympics. Some household names along with some new faces have emerged as stars for Team USA including Lilly King, Ryan Murphy, Caeleb Dressel, Michael Phelps, Ryan Held, Nathan Adrian, Katie Ledecky and Virginia Thrasher. Many of us waited for the return of legendary gold medalist Michael Phelps who had already taken home 22 Gold Medals came through with number 23. 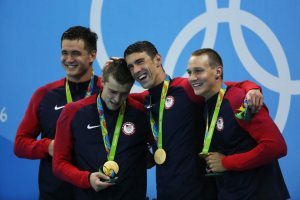 Phelps’ first event in Rio, 4×100 meter freestyle, and it was his 19th gold. Phelps took over for the second leg from Caeleb Dressel in second place just behind France. By the time he finished his leg, Team USA were over a second ahead. Ryan Held and Nathan Adrian maintained the lead for the rest of the way to take gold in 3.09.92. Phelps’ split of 47.12 was the fourth fastest of all the swimmers. Another rising star by the name of Katie Ledecky took the stage and won big in the Women’s 400-meter freestyle. The blazing fast time of 3:56.46 shattered her previous world record, and was almost five full seconds ahead of second place finisher, Jasmin Carlin. Make sure to tune in for more on the latest results and games at the 2016 Rio Olympics. 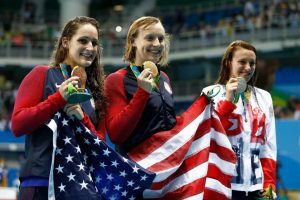 If your company is interested in finding out availability and booking fees for an Olympic athlete like Lilly King, Ryan Murphy, Caeleb Dressel, Michael Phelps, Ryan Held, Nathan Adrian, Katie Ledecky and Virginia Thrasher or other sports celebrities for a Keynote Speech, Charity Event, Guest Appearance, or Football Camp, call us at 1-888-246-7141.